This weekend I saw something that really made me mad. I was watching ESPN and saw some talks about a college brawl. 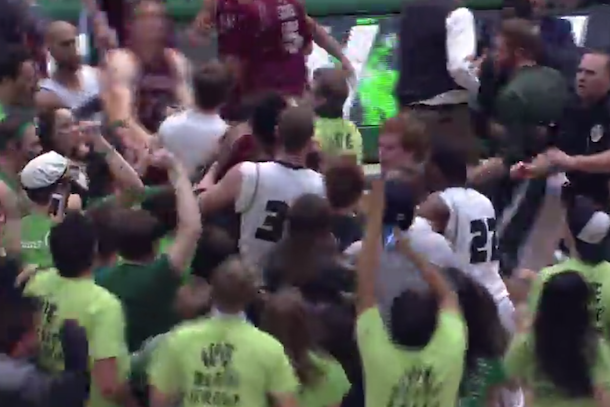 Everything seemed normal as a New Mexico State player threw the ball at a Utah Valley player in the closing seconds of the game. A normal player on player confrontation seemed likely but instead the crowd rushed the floor because of the win. The fans from the crowd then engaged in a fight with the New Mexico State players. I really hate to see things like this because I feel like for most people the players are automatically in the wrong. The NCAA disciplined two of the players with suspensions but what about the fans? What happened to them? It feels like whenever a player and fan get into it the fan is always the right one. Its like the fans can’t get disciplined. I swear the NCAA forgets that these athletes are normal people like the rest of us. If a sworm of people come running at them ready to fight the odds are there hands are going to go up in order to defend themselves. I feel like athletes, especially college athletes should never be in a situation like that. As an athlete you shouldn’t feel like your in a situation where you have to defend yourself from fans. Others sports have banned this but for some reason in college basketball its still allowed. I feel as though its unsafe for everyone involved and should be put to rest. There are too many emotions on the floor right after the game ends for a bunch of people rushing the floor plus its just not safe anymore.